When I was a boy, Mom would come home from the grocery store and I would help her unload the brown paper sacks of groceries. If I saw anything wrapped in butcher paper, I knew we were in for treat. That meant Dad was going to barbecue. And then, sometimes, there would also be a long brown paper bread sack. I knew immediately that she had bought Italian bread and that meant we were going to have spaghetti with that bread and my Mom’s yummy homemade spaghetti sauce. We can tell a lot about something by the paper it’s wrapped in. It’s the same this time of year, and any time we give gifts. We can tell by the wrapping paper what holiday or special occasion it is. Birthday wrapping paper doesn’t look anything like Anniversary wrapping paper. And Valentines wrapping paper doesn’t look anything like Graduation wrapping paper. And Christmas wrapping paper doesn’t look anything like baby shower wrapping paper. 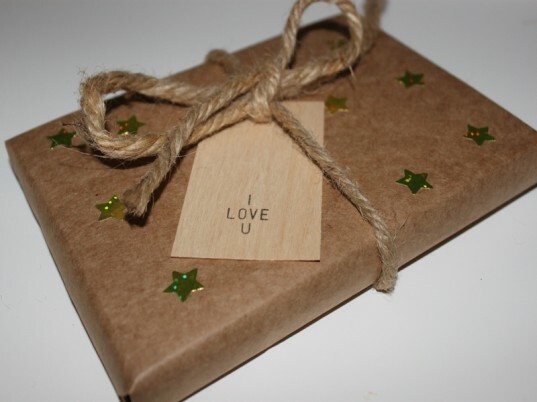 We can tell a lot about a gift, just by the wrapping paper. But if we’re not careful, we might just miss the most extraordinary gift of all. You see, this gift is wrapped in plain brown wrapping paper, and we think we can tell the worth of a gift by how it’s wrapped. In the Kingdom of God, God turns everything on its head. And what we discover is that the gift that looked the least promising was actually the greatest gift of all. That is because, on Christmas day, the hope of the world was born, and God’s gift of grace to the world came packaged and wrapped NOT in the splendor and glory of Heaven; but in the plain brown wrapper of human flesh. The Hope of Humankind, the Grace and Forgiveness of God, the Salvation of the world, came wrapped in swaddling clothes and lay in a manger. Our Hope came in the plain brown wrapper of the Christ child, and came in the plain brown wrapper of the the people and the place surrounding his birth. We get distracted by all the glitter and glamour. We get distracted by the wrapping paper of the world. But God places his greatest gift in a plain brown wrapper. Just look at Mary. She wasn’t a beauty queen. She wasn’t a star. She was from a poor family. She was uneducated. There is no historical footnote about how glorious she was that would cause God to choose her. We do know she was a young, every day sort of girl, filled with faith. She calls herself “lowly,” and a “servant.” It means literally, a person of low position or insignificance. God wrapped the birth of His Son in the plain brown wrapper of Mary. The same holds true for Joseph. God could have chosen someone who was wealthy. God could have chosen someone with money, fame and influence. The message might have gotten spread quicker. More people might have believed. Instead, God chose the plain brown wrapper of Joseph, the carpenter. In that day, carpenters were low on the social scale. They had very little influence in the world. They were needed, but were paid low wages. It wasn’t a trade to make a fortune in, or to get famous, but it kept food on table and a roof over their heads. Then there’s Bethlehem…A little town, without much to offer. It’s not far from Jerusalem, half a day’s journey on foot. It’s mentioned only a few times in the Bible. It’s where Ruth and Naomi settled. It’s where Jacob had Rachel buried. And it was the birthplace if King David. That’s why it’s called the city of David. It’s the birth place of the prophet Micah. But Bethlehem was of little consequence. The Temple had been built in the big city of Jerusalem and it outshone everything. The prophet Micah wrote: “But you, O Bethlehem of Ephrathah, who are one of the little clans of Judah, from you shall come forth for me one who is to rule in Israel.” Bethlehem was just a small town. But God took the plain brown wrapper of Bethlehem and made it a Jewel of hope. And what about the stable in which Jesus was born? Surely God could have come up with something better than that for his own son. And yet this simple stable changes the world. Who would have thought a child born in a barn could change people’s hearts – Hearts that have grown cold; hearts that have forgotten the love and grace of God; hearts that have built walls to keep themselves away from God. God uses the plain brown wrapper of the birthing place of Jesus to melt our hearts. And then there was the baby, God, entering into the world as an infant. There is nothing more ordinary or more hope filled than the birth of a baby. God took something as simple as the birth of a baby to bring hope to our world and to our lives. Christmas reminds us of the hope we felt at our own children’s birth. Somehow, that hope, gets lost in the piles of dirty diapers and in the messes we clean up. Somehow, during the living out of our daily lives, the hope of that birth gets buried beneath the accumulation of bills and expenses, doctor and dentist appointments, busy schedules and endless worries. But this season of the birth of the baby Jesus lets Hope be reborn. We see the Son of God, our savior, born not in a palace, not someplace far removed from the suffering of the world, but in the plain brown wrapper or the manger and our hearts find their place and their peace once again. Today, in our gospel reading, Mary’s song of praise can help us to rediscover that hope. Her song is often called the Magnificat, because of its opening words where Mary says, “My soul magnifies the Lord.” It’s a song that is beautiful in its simplicity and truth. It’s a song that tells us about our loving and gracious God, who is coming to set things right in this world. It’s a song that points us to God’s gift, the gift of his Son, our Savior, Jesus the Christ, a gift wrapped in a plain brown wrapper. This morning, we will reach out our hands and accept the gift which God has for us. We will receive this gift of God in the plain, common, earthly elements of bread and wine.